The Phoenix was built in 1893, and is Cincinnati's finest example of Italian renaissance architecture. It was originally known as The Phoenix Club, the first Jewish Businessmen's organization in this region of the country. The architect was the renowned Samuel Hannaford, best known for his design of Music Hall, and also the architect for other great Cincinnati landmarks such as City Hall, St. George Church in Clifton, and the building that is now The Cincinnatian Hotel. The Phoenix Club was purchased in 1911 by the Cincinnati Club, located around the corner on Garfield Place, as a sports annex. Three enclosed walkways, which are no longer functioning, were built between the buildings. The winding white marble staircase is considered to be one of the finest of its kind in North America, and is enhanced by the building's Tiffany glass. All of the marble and stained glass are original, imported from West Germany, and date back to the early 1880's. The huge hand carved library breakfront in the restaurant was built entirely on-site, in what is now known as the President's Room, in 1905. The building looked quite differently as a sports annex. In the basement there was a full-length lap pool and bowling alley. The Archway Ballroom, on the second floor, was the Billiards Room with approximately 25 billiards tables. The Grand Ballroom, on the third floor, was a basketball court with a balcony for spectators on three sides. The building was closed in 1983 when interest in private clubs dwindled. 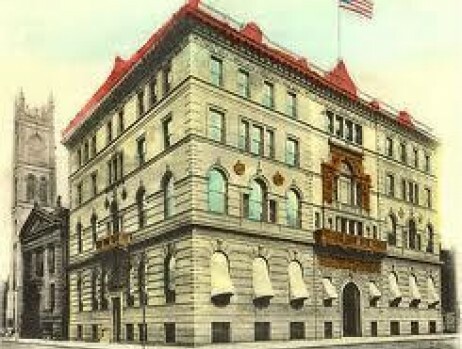 The Cincinnati Club sold the building and it was boarded up and left unattended for three years. In 1986 the building was purchased again, and renovation began to restore the building to its original splendor, as in the mythical legend, rising from the ashes to live again. The restoration was completed in June of 1988 and reopened to the public as one of the city's finest private dining and restaurant facilities. During the renovation it was essential to maintain the architecture and decor of such a unique historical landmark. The stained glass windows located on the second floor in the Archway Ballroom were stolen from the building sometime between 1984 and 1986. They were dismantled and carried out without anyone knowing. The person suspected of the theft was eventually charged, and tried for the crime. The windows were recovered when an unknown person placed them in the hallway of the courthouse during the trial. The case was dropped and the windows were placed back in their original home. Only a few small pieces were never recovered, recognizable by their darker shade of brown. On, April 13, 2013, Joy Kraft from the Cincinnati Enquirer wrote a nice article on the history of The Phoenix throughout its 120 years in an article titled The Phoenix: Race Street's Italian Palace, April 14, 2013.